This time of year is so dreary and uninspiring. September and October content writes itself with the deluge of pumpkin curries and butternut squash soups. November and December are chock-full of heavy comfort foods and holiday prep, and January has us whipping up robust salads in order to get our dignity back. But February. February is a head-scratcher, especially if you aren’t into dying all of your food pink and red. Luckily, inspiration tends to hit me unexpectedly. Like when I’m standing in my morning-lit kitchen sipping a cup of matcha tea and making a batch of cinnamon-infused granola. I wonder what these two things would be like together? Matcha brings granola to a whole new level of awesome with it’s slight bitterness and earthiness. And, with the cinnamon and maple syrup, it still caters to the American palate. Thanks to big chain coffee joints, America hasn’t been enjoying the matcha the same way that Japan has been enjoying it for centuries — whisked in a small bowl with hot water; no milk or sugar. Here, we’ve been sipping sweet and milky lattes that could easily be dubbed as the Shamrock Shake’s older and slightly more sophisticated cousin. My hope is that this recipe brings the matcha sweetness we’ve grown to know and love here in America together with the true raw vegetal flavors being sipped in Japan. 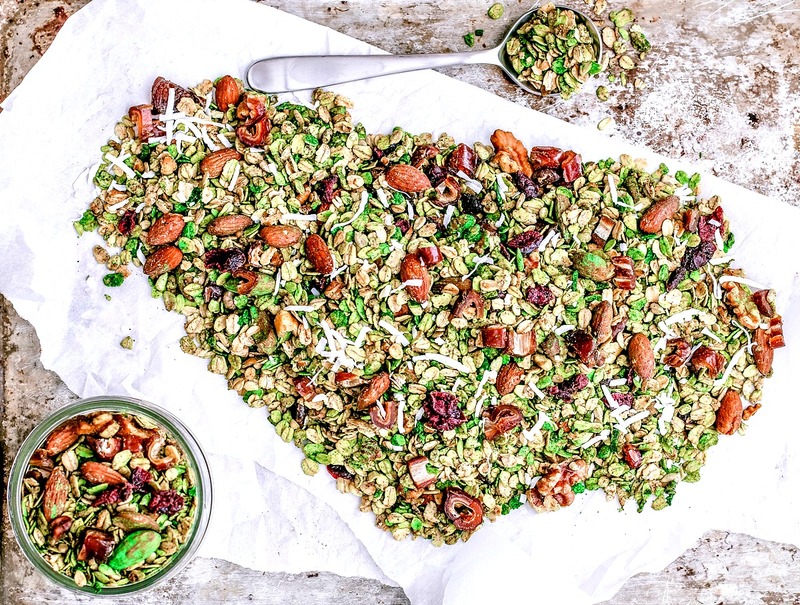 This matcha granola is tossed with cinnamon, maple syrup, unsweetened coconut, raw nuts, raw seeds, chopped dates, and dried cranberries. Pop it in your mouth as a healthy snack, sprinkle it over yogurt, or splash some milk over it for a fab start to your day. Arbor Teas’ Organic Matcha Green Tea. There’s no wondering why this cooking-grade matcha has a five-star rating on Arbor Teas’ Website. It’s silky smooth with a welcomed bitterness, making it ideal for whichever way you’d like to treat it — as a daily beverage, an occasional treat, or in your cooking. This vibrant tea comes straight from the Shizuoka Prefecture, known as the capital of Japanese green tea production, located in central Japan. Because the demand for tea is so high in Japan, most of the tea grown there is consumed there, leaving a minimal amount for export. Not many people outside of Japan get to experience the magic that is Japanese-grown tea; luckily, Arbor Teas gives you the opportunity. With high-quality tea comes true health benefits, too. Research suggests that tea has plenty of positive effects on our health, like improving our immune systems, reducing the risk of cancer, and aiding our bodies in maintaining homeostasis to balance stress levels. Matcha in particular has high levels of L-theanine, an amino acid that helps balance stress levels while promoting a sense of calm and focus. I think we could all use more of this in our lives, no? This Matcha Granola combines toasty rolled oats with chopped dates, cinnamon, maple syrup, raw nuts, raw seeds, and unsweetened coconut making it a healthy snack or breakfast option. In a large bowl, combine oats, nuts, seeds, coconut, cinnamon, and sugar. In a separate bowl, combine coconut oil, maple syrup, and salt. Whisk well, and pour the mixture over the oat mixture; toss to coat. Spread the mixture out onto a large baking sheet and bake for 1 - 1.5 hours, stirring the mixture every 15 minutes with a spatula or wooden spoon. When done, remove from oven and let cool. Scrape the granola into large bowl, then sprinkle the matcha over and toss to coat. Add in the dates and cranberries, and toss. Keep sealed in a freezer bag or container for up to three weeks. Yum! This looks so amazing! I love how nutrient-packed it is and free of any refined sugar or gluten....and I love adding matcha to things! What a great creation! Dreary indeed! But hooray for inspiration! What a great twist on granola! Oh, my -- this is exactly how inspiration hits me -- I'm drinking a cup of coffee and see a bag of coconut -- voila - coconut-coffee macaroons. It's amazing the brilliant ideas you can come up with while sipping a cup of tea! I love any and all kinds of granola. This sounds so good!